My first memories of this golden and velvety voice coming to focus was around the age of 7 or 8. My uncle used to have an early version of what later would be termed the music centre. It was basically a Radio with a small Cabinet on the side that housed the record player. He had mostly the Short play records (SP) with Angel Label on them. These SP’s contained normally shortened version of the original songs so they would fit on the SP’s. I never asked him if he was Fan years later as he moved and we sort of lost touch but I guess he must have been as his record collection featured nearly all of the films where Rafi saab was prominant. Dosti, Neel Kamal, Susaral, Suraj and Arzoo. I never understood the words coming from a Punjabi family and having just learned to speak English Urdu was a million miles yet. But his voice was so pleasing to the ears and his singing was hypnotic. Strangely enough It would be a while later before I realized the Dharmendra indeed was not Mohammed Rafi. My father used to take me to watch the movies on a Sundayâ€™s (Asian’s normally hired the Cinema on Sundays to show Indian Movies). I remember I said to him I want to go and see a Mohammed Rafi film he couldn’t understand what I meant till I pointed out Dharmendra and chuckled and said that’s not Rafi saab. I was a little disappointed as Rafi saabs beautiful voice and Dharmendra’s looks were like an ideal match. Even today I believe that it was the ultimate combination but that is purely my personal preference. I was enchanted, hooked and so drawn in by this beautiful macho voice that sang to such lofty heights only to drop in a single breath to the depths of a low note without the slightest loss in tune or Sur. I looked forward to going on Sundays and My dad would specifically take me to see a movie that he knew was dominated by great Rafi Saab numbers. My enthusiasm just kept on growing. For me now he was a part of my family, I would fondly later on in life, when talking with anyone about him, refer to him as my uncle. Off course this would be met with laughter, I would laugh as well but little did they know I was being serious. Such was my love for this great human being. In the second stage of my Rafian career I started to pick up on the Urdu/Hindi poetry. This was like someone now letting me into the house of wondrous sounds that I had stood outside for so long. It was amazing as now the emotions of each song were redefined with a meaning. My love for him grew even more. His delivery on every word, his heart felt anguish, he’s romantic overtone that would melt the heart of the most stubborn beauty. “Eh Nargasi Mastana bus itni Shakyat hai” blew me away. I had heard it before but now it was 10 times better. Then can came the dark period, when Rafi Saab cut down on their singing to the point of completely stopping. My world simply fell apart. I could not understand someone who everyone knew was the best was no longer there. Where did he go?, whatâ€™s happening and who the hell is this Yodeller I thought. My favourite actor Dharmendra now singing with a nasal warbly voice – what the heck is going on? I stopped going to the movies. I would scour the record shops just to check out the new movies to see if they had any Rafi Saab songs and if they did thatâ€™s the one I would go and see regardless of how good it was. It took me years to go and see Sholay even though everyone raved about it. I could not bring myself to go and see a movie that did not have that beautiful golden voice in it. For 3 years I was lost and bewildered as to what happened to the perfect voice. The house I had so longed to enter now seemed empty and bare with just a cold wind blowing through it and an echo of “Aaja tuj ko pukare mera pyar”. Where was he? Then in 1975 while scouring a record shop in Southall West London I saw Laila Mujnu, I hesitantly picked up and saw Rishi Kapoor on the cover and fully expected all the numbers to have been sung by KK. To my surprise and great Joy all I saw was RAFI,RAFI,RAFI and more RAFI. I was ecstatic filled with Joy. Then just as it had gone it was back. The house of golden voice was cleaned out, a new fire lit in the fireplace and the tremendous sounds of Chaacha Batija, Dharam Veer, Sargam, Aaasha, Amar Akbar Anthony and many more came one upon the other. The king had truly returned to his realm welcomed back with out stretched arms from music directors that so longed for his return from his sabbatical. I was now back at the movies, I no longer needed to check the records as even the so called MD’s that favoured the other guy flocked to have the great man grace their songs. His voice could be heard again in the record shops when people asked for a new song from a new film. It filled me with joy. The dark days were truly over. Finally I will end it here as the end is too painful as In my heart, and I am sure I speak for all true Rafians, he has never left, as the house I spoke of is firmly and truly in each every one of our hearts. On a personal note it is a great honour to share the same birthday as the great man. This entry was posted on Sunday, December 23rd, 2007 at 7:47 pm	and is filed under Meri Awaaz Suno. You can follow any responses to this entry through the RSS 2.0 feed. You can leave a response, or trackback from your own site. I just want to say thank you all for the nice comments and appreciation..
Mohammed Rafi was the GREATEST Male Singer in North Indian cinema. No one after him has even come close. Long Live the KING!!! VOICE OF GOD nothing else. 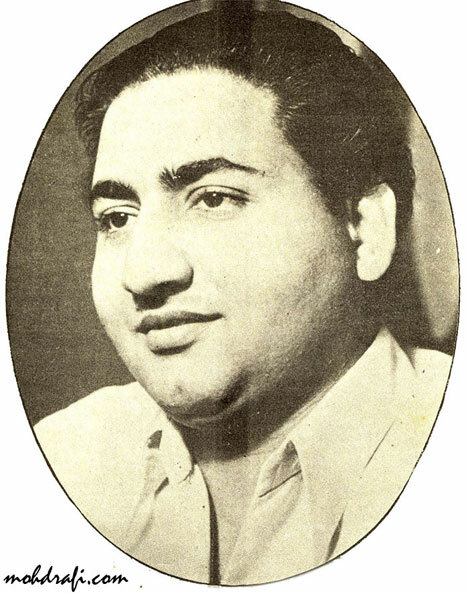 Mohammad Rafi was the master of playback singing in India. To me he was as adorable as Hazrat Muhammad.His devine melody puts his position as Next to the Prophet.His songs made of devine clarity and full throated ease.I like his song “Jaag dil-e deewana mastana”. playback singing ke ander ager yeh poocha jaye ki baadshah kaun hai to ek hi naam zubaan per aata hai aur woh hai mohd rafi shahb.mohd rafi shahb ke baare kye keh kuch samajh hi nahi aata.kya awaaz kya gaane ki range kya charcter ko dekhker gaana.ager dev anand gaa rehe hai lag raha dev gaa rehe hai.dilip gaa rehe hai to lag raha ki dilip gaa rehe hai.khud bhaut se hero ka maanna tha ki unka kaam rafi sahab ki awaaz ke bina nahi chal sakta.kya uper wale ki den thi.aur sabse badi baat yeh thi ki koi forml training nahi thi.jabi to kehte hai ki kalakar paidayishi hota hai.rafi shahb paidayishi kalakaar the.aur ager hum unki gaane ki range ka ziker kere to is mamle me koi bhi unke aaspaas nahi phatakta.unki range ko hum kewal aur kewal himaylo ki chotiyo se laga sakte hai.yeh range to unhone apne started career me hi dikha di thi.beju bawera ke geet ‘o duniya rakhwale sun dard bher mere naale’ me hum range ko sun sakte hai. mohabbat zinda rehti hai mohabbat mer nahi sakti, subh naa aayi raat na aayi jis din teri yaad na aayi, gam udhne ke liye main to jiye jayooga aadi ke ander rafi shahb ki range dekihye. kya unki range ki koi barabari ker sakta hai bilkool nahi. RAFI SHAHB KI SABSE BADI KHOOBI YEH THI KI WOH CHARACTOR KO DEKHKER GAATE THE.DEV ANAND,DILIP KUMAR,SHAMMI KAPOOR,RAJENDER KUMAR,RAJESH KHANNA,AMITAB BACHCHAN,PERDEEP,VISHVAJEET,JEETENDER AUR NA JAANE KITNE HERO KE LIYE RAFI SHAHB NE GAANE GAAYE.AISA LAGTA THA KI HERO KHUD HI GAANA GAA RAHA HAI.YEH RAFI SHAHB KA HUNER HI THA KI WOH HERO KI AWAZ KO APNI AWAZ ME MILA LETE THE.JAB KOI UNKI AWAZ KI TAARIF KERTA TO KEHTE ‘ MERI TARIF MAT KARO JISNE YEH AWAZ DI HAI,USKI KARO. REALTY HE WAS A VERY-2 SIMPLE PERSON IN HIS LIFE.FACE PER HAMESHA KI MUSKAN UNKI SAADGI KA EK NAMOONA THI. HIDUSTAN YO KYA PURI DUNIYA KE LOGO KE LIYE RAFI SHAHB KI AWAZ UNKI ZINDAGI KA EK HISSA BAN CHUKI THEE. UNKI AWAZ SE LOGO KA DIN NIKALTA THA AUR UNKI AWAZ SE HI LOGO KA DIN DHALTA THA.UNKI MAUT HUM SAB KE LIYE EK NAAKABILE-ITTALAYE-NUKSAN HAI.MAIN SAMAJHTA HU KI UNKI JAGEH HAMESHA KHALI REHEGI. INHE NAGHMO KI JAA EHLE NAZER U HI NAHI KEHTE TERE GEETO KO DIL KA HUMSAFER U HI KEHTE.DHUKHI THE LAAKH MAGER MUTMAUEEN THE DARD KE MAARE TERI AWAZ KI SHABNEM SE DHUL JAATE THE GAM SAARE.TERI TAANO ME HUSNE ZINDAGI LETA THE ANGDHAYI THUJE ALLAH NE BAKSHA THA AWAZE MASIHAAYI.TO HI THA PYAR KA EK SAAZ IS NAFRAT KI DUNIYA ME GANIMAT THE ERI AWAZ IS NAFRAT KI DUNIYA ME.RAFI SHAHB KI AWAZ TAQAYMAT HAMARE DILO ME MEHFOOZ REHGI MEHFILO KE DAMANO ME SHAHEELO KE AAS PASS YEH SADA GOONJEGI SADIYO TAK DILO KE AASPASS. It is now 2008, the great Mohd Rafi is still my favarate singer since his legendary voice touched my hearings in the early seventees. To people like me who are not Indians, his voice was stoshing and touchable.The great love and humanitarian sence in his voice touched my soul and inspired my heard. I was very sorry and terribly shocked when one of my friends came suddenly one day in 1980 and told me that Mohd Rafi (is donya me mowjood nahen he! ) Years past but his memeory, oska awaz, mere atma ki awaz ta or, rehaga. Wish you happy Birth day. You are eternal. Through your voice God sings. This article rates as one of the finest and all congratulations to Mr Mohammed Taj. Sir, while you have expressed such wonderfully your thoughts and experiences with the greatest singer of modern era, you have infact only echoed the feelings of many like me. in fact the strange aspect that you that dharmendra to be rafi sahab, was what we had all grew up with. for us sometimes rafi sahab was the hero of a ‘devanand film’ and sometimes of a ‘rajendra kumar’ film. we had all imagined rafi sahab to be the ultimate hero – what with his macho, soft and romantic voice. it would take us too a great many years to understand that rafi sahab only lent his voice from the background. but how godly that rendereing was, would be known after the songs went on the radio and the record players. the songs remain still afresh today. one would enjoy these songs with the same fervour and passion that they generated nearly four decades back. the movies have faded. one may not be able to watch a full length movie of yesteryears, however great it may have been. but to listen to rafi sahab’s songs, age and decades are no barrier. congratulations once again for expressing your wonderful feelings in such a essayist manner. I fully agree with Mr.Narayanan that rafi saab lives in our hearts in our homes and in our blood.But at the same time it disturbs us that rafi saab is ignored by the media , industry etc. HOW CAN THE BEST SINGER OF BOLLYWOOD BE IGNORED LIKE THIS AT THE COST OF ORDINARY STREET SINGERS. RAFI SAAB YOU WILL ALWAYS BE IMMORTAL TILL MY LAST BREATH IN MY HEART . Binuji I am from ahmedabad and please let me know in what way I can promote the legacy of rafi saab .I shall be glad to do so in whatever little way I can. RAFI SAHAB YOU ARE ALWAYS FONDLY REMEMBERED BY ALL UR FANS,POOJARIS AND INNUMERABLE MUSIC LOVERS. WE SHOULD NOT BE BOTHERED BY SOME IGNORANT MEDIA OR TODAY’S RADIO/TV OR THE FILMI BACHAS. INFACT I HAVE KEPT THE IDIOT BOX IN THE COLD STORAGE AS IAM TIRED OF MEDIA SENSILISATION BE IT RAKHI SAWANT OR SOME ENUCH BOBBY. RAFI SAHAB WE ALL SALUTE THE GREATEST BOLLYWOOD PLAYBACK OUTSIDE THE MEDIA IN VARIOUS TRIBUTARY ORCHESTRA , WITH FIRENDS OR WITHIN OUR HOME LISTENING TO HEAVENLY VINTAGE FILM MUSIC CREATED BY YOUR GOLDEN MELODIOUS GODLY VOICE. BINUJI IF U CAN PUBLISH THE FEEDBACK EMAIL ID OF SOME OF THESE INGNORANT CHANNELS PL HELP US AS THEY WILL BE FLOODED WITH PROTESTS FROM ALL OVER. It is very unfortunate that media is continuously neglecting Rafi sb. Even they do not write a single word on the death and birth day of the great singer and human being. What a pity that the http://www.indianmelody.com is posting an article on Rafi sb published in the Express India on his 19th death anniversary-they did not find any recent article. Few days ago I was watching a program on LP on Zee Cinema. In the program film Amar Akbar Anthony was mentioned and KK’s song ‘my name is anthony gonzalves..” was shown. Can anyone believe not mentioning Parda hi parda while discussing the songs of Amar Akbar Anthony? Is it just ignorance of media or there is some motivated effort? I request the conversant people to speak about this issue. This is indeed a very heart touching article. Thanks for sharing your thoughts with us. I think so these are the last few lines which was sang by Rafi sahab. “Happy Birthday Rafisab”. On behalf of ALL MALDIVIAN. We miss you very very very much. The less said about this Indian media, the better! They were all actually licking the painful wounds inflicted on them by Modi Ji. 1.-RAFI Without Naushad or Naushad without Rafi..can not be imagined. 2.-The super duper hits from BAIJU BAAVRA, MOTHER INDIA, RAM AUR SHYAM, AADMI,GANGA JAMNA….MUGLE AZAM…KOHINOOR….and so many..
unforgettable songs are the establshed facts to narrate the story of this duo. 3.-HUNDREDS SALUTES ..TO THE GREAT PERSONALITIES ..NAUSHAAD SAAB AND RAFI SAAB….. Happy birthday to Naushad Saheb. He was very fond of Rafi Saheb and knew only Rafi Saheb was capable of singing his songs. Both made great songs which is world wide known. May his soul rest in peace, ameen. plishments and my thanks are due to them..
to talk and register our protest for their sub-standard fare. will not be enacted and we will be spared of their distorted news. HAPPY BIRTHDAY MOHAMMED RAFI SAHAB JI. I always wonder what types of songs would you,Sir ,be singging if you were with us in this era and time.I am sure you,Sir, would still be the number One singer that heroes,producers,musicians,directors,fellows singers would be queing up to get you to sing for them.Filmi Duniya Hi Kuch Aur Hoti Agar Aap Yahan Hote.Whereever you may be Sir ,HAPPY BIRTHDAY ONCE MORE.Mera Dil Yahi Kehti Hai Ki Tu Kahin Aas Paas Hai Dost. A very heart touching article indeed.As I read the article my heart was filled with mixed emotions of joy & pain.The joy of reading an article about our rafi saab and the sadness about the continous neglect of our rafi saab by the media, the industry and people alike . Today i am planning to switch on the radio and listen to the golden songs of rafi saab in his sweet and velvety immortal voice that will last for generations to come. We all in our family are fans of rafi saab and not a day passes without ever mentioning his name. My eyes filled with tears as I read this article.I LOVE YOU RAFI SAAB AND YOU ARE LIKE MY FATHER. The first thing I looked in the paper today was not the victory of Narendra Modi in Times of India but wether any mention of rafi saab has been made or not.But alas what I feared came true.Not a single word about rafi saab. I remember very clearly that on birthday of KK there were discussions on TV channels.It really pains me very much that the best singer is neglected and ordinary singers such as horrible KK, Asha are celebrated. My trust in GOD comes down when I see this. RAFI SAAB I MAY BE NOT THERE IN THIS WORLD AFTER SAY 50 YEARS BUT YOU WILL ALWAYS BE THERE THROUGH YOUR GODLY VOICE. I SALUTE YOU FROM THE BOTTOM OF MY HEART AND I MISS YOU VERY MUCH. TOO KAHI AAS PAAS HAI DOST. Yes, Rafi Saab is around us as a fragrance of his melodies. We love you Rafi Saab. Very nice, nostalgic presentation by you, Mr. Mohammed Taj. I can recall having been in the same stage during my childhood, ie. mistaking the heroes for Rafi Saab. May God etch Rafi Saab’s memory permanently on this earth! Rafisaab, you have been always in our thoughts and hearts since we knew what music is, what is humanity and humility is, simiplicity and charity is. You are one person rolled into one treasurehouse possessing all these divinue virtues. You will always remain with us through your melodious and eternal voice. Janam din aapko mubark ho !!! we miss you a lot!!! dear Mohd. Taj very good article and thanks for sharing your feelings about rafi saheb. Today (24 th December) is his 83rd birthday. After 27 years of his death he is still alive among music lovers in the Earth. Long live Rafi Saheb and all rafians. Rafi saheb sang the above birthday song under compositions of Naushad Saheb in Ram Aur Syam(1967), where Dilip Kumar in dual role. 2marrow (25th December) is the birthday of Naushad Saheb. Both the legends will immortal for their marvelous creation in music world. It’s 27 years gone since you departed this life Rafi saheb, but the memories you left behind will live for generations to come. Your songs of various moods is what’s magic, I HUMM some of the your great songs and suddenly the memories comes to me………. Sad. Rafi fans from all over, we have the memories to remember. Many Many Happy Returns of the Day to our Dear Rafi Sahab. 1.- A touching and beautiful article from you, for all of us. My compliments. 2.-The song BAAR BAAR DIN YE AAYE ..exactly fits for Rafi sahab. 3.-I am lucky enough to share with you that,I am really fortunate enough that, BY THE GRACE OF THE GOD, My birth date is also 24th December..means to-day..
4.-This is nothing but a great coincindence for me. 5.-Being a Rafiaan,I feel this is the greatest gift showered on me by the God. Singers may come and singers may go but Rafisaab will go on forever! 83 years back, the World was blessed with the birth of Rafi Saab. Even 27 years after he left, we are still singing his songs and every time we listen to his song, we discover something new in these songs. Rafi Saab, you have not left us but you are in our heart and daily we, utate, jaaget, chalte, sote, aap ke gane gungunate rahte hain. Yes, today it’s 24th of December, 2007. 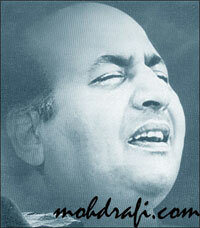 It’s Mohammed Rafi Saheb’s 84th birthday. Happy birthday Rafi Saheb. It is very hard to believe after 27 years of Rafi Saheb’s death, he’s still active and alive in millions or say infinite of hearts all over the world. There will be no another Rafi Saheb and that’s a guarantee. Even God needed him, hence, He took him from us. Rafi Saheb, you are and will always be in our hearts, it’s just impossible to forget the legend. Yaad na jae, beete dinon ki… May his soul remain in peace, Ameen. Beautiful artical, tuching my heart. baar baar din yeh aaye, baar baar din yeh gayeh aaap jiyo hazaron saal , yeh meri hai aarzoo, happy birthday to you to our most loving rafi sahab. rafi sahab you have always lived in our hearts since we knew what music is, what melody is, what humanity is, what kindness is, what humility is, what simplicity is & what charity is. You are the tresurehouse of all these divine qualities. secondly your ever pleasing smile in any photograph we see always motivates us for a pleasant living. we love you, we respect you, we adore you our most dearest rafi sahab. janam dinki badhayi ho rafi sahab.